At KRISS USA, innovation, quality, and value are the foundations of everything they make. California legal Kriss USA Vector carbines are available from Cordelia Gun Exchange! 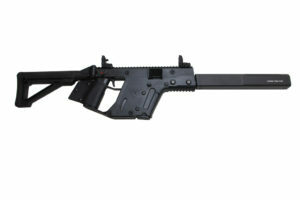 California Compliant KRISS VECTOR CRB GEN 2 9MM BLACK RIFLE. Available in California from Cordelia Gun Exchange. Taking great pride in producing the type of small arms, training replicas, and accessories that you can recommend to family and friends. Pistol caliber carbines that share magazines with Glock pistols are great for someone who wants to keep a minimalist pistol/rifle setup and consolidate ammo for range day!